Before we moved to Singapore, we lived for a year in Hong Kong. In recent years, Hong Kong has taken the place of one of the top destinations for Singaporeans to visit. There are lots to do from the great food, to the shopping and the amazing scenery. 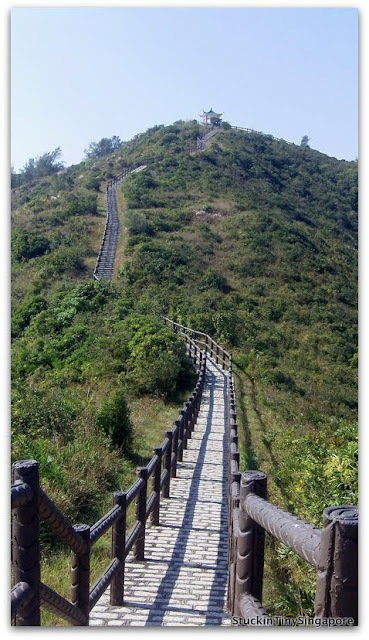 Yep you hear right, Hong Kong has great scenery, more than 70% of the country is designated as country parks. The number of hiking trails is staggering. You get amazing mountain and sea views from every corner. Most people thinks of Hong Kong as a city with amazing skyscrapers, but what most tourists won't see is the quieter side of HK, the country parks, the greenery and the village life. Thus I won't be writing about most of the standard places that Singaporeans are sure to visit during their trip. What I will write about are off the beaten track. So to start off with, I took a friend who was visiting to Cheung Chau. Hong Kong has many outlying islands that make a good side trip and gives the visitor a different perspective of Hong Kong. Getting to them are easy as they are served by regular ferry services from Hong Kong Island. You can board the ferries at Central Ferry Pier which goes to Cheung Chau, Peng Chau, Lamma Island and Lantau Island (Mui Wo and Discovery Bay). 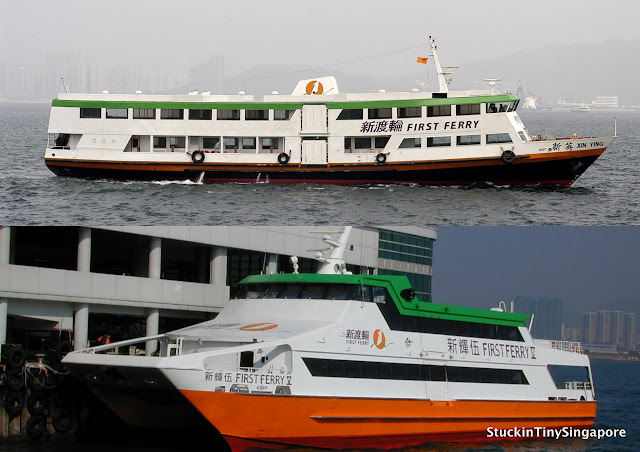 There are also inter-island ferry that connects Peng Chau with Nim Shue Wan at Discovery Bay and the Trappist Monastery on Lantau Island. First Ferry is the company that takes you to Cheung Chau. You have the choice between the normal ferry or the fast ferry. It takes around an hour on normal ferry or 35 to 40 minutes on the fast ferry. The price difference is around HK$10 between the normal and fast ferry. There is different pricing for weekdays/weekends and ordinary/deluxe class. For more information, do check online here. When you first arrive on the Island, you will notice the lack of cars. The only motorised vehicles on the island are emergency and police vehicles. 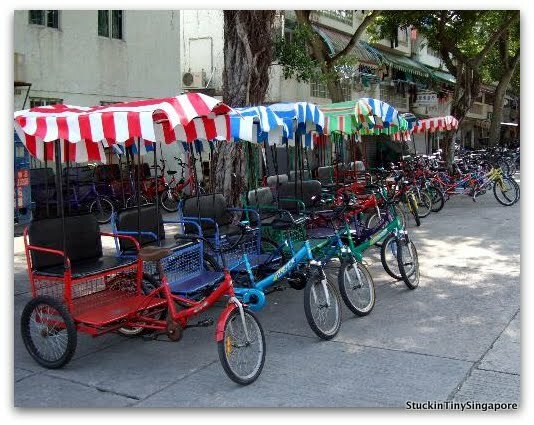 There are plenty of bicycles and two-seater tricycles with sun canopies for hire from shops on the harbour side for tourists and visitors to get around the island. 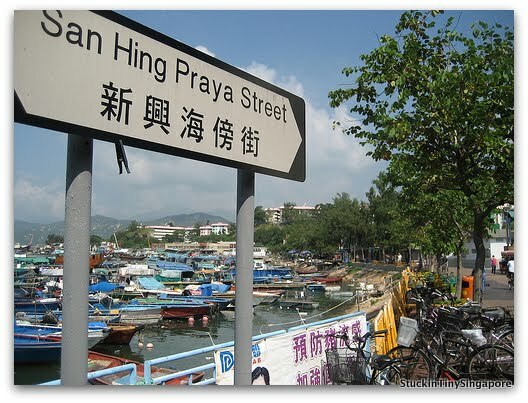 The main street at Cheung Chau is Praya street where you can find numerous stalls, ranging from accommodation rentals to bicycle hire to food stalls. Most people come to Cheung Chau for their seafood and dried seafood produce. Everywhere you walk, you can see fishes being laid out to dry and stores selling the dried produce. So before we start to explore the island, we stopped for a seafood lunch at the many stalls that lined the seafront. The meal for 3 cost us about HK$250, a bargain which consisted of the Mantis Shrimps, clams, a fish, a soup and vegetables plus rice. Most importantly, the seafood was super fresh. As we were eating, a boat came up to the side and hauled up bags of freshly caught seafood! After our filling lunch, we went for a hike around the many trails they have on the island. So if you are in Hong Kong and are bored with the usual that the Pearl of the Orient has to offer, why not try visiting one of the many outlying islands like Cheung Chau.